Shree Shakti Engineering is a pioneer for manufacture and supplier of the EOT cranes in Ahmedabad, Gujarat. First on EOT stands for Electric overhead Travelling, so in essence this can movable overhead cranes that is powered by Electronics. EOT cranes are one of the most popular lifting solutions used across a wide range different workplace such as assembly line, research facilities and production plants. We are one Ahmedabad leading Overhead Crane manufacture offering modular Component packages which cover an entire load range capacity up to 500 tons. This EOT cranes working principle comprises of profoundly three working movements Crane hook, up and down lifting, Trolley parallel movement. An EOT crane exporter serves a larger area of floor spaces within its own travelling restrictions. An Eot Crane Manufacturer or Electric overhead travelling cranes have broadly utilized as a part of indoor and outdoor industrial and mining enterprise, steel plants, railway transportation etc. Motors utilized are particularly intended for crane duty and discovers in and a manner the work zone requests of successive beginning turning around and breaking. Design and manufactured in accordance with defined industry norms. Highly useful for materials lifting and moving applications. The Electric Overhead Travelling Cranes is made of value materials that keep going for long. Shree Shakti Engineering works made crane of steel that make it solid and therefore can withstand the high weight of the overwhelming burdens. It is additionally impervious to operators of erosion. The external yellow paints make it lovely and in addition keep it from erosion. So that this makes EOT cranes more though than regular cranes. 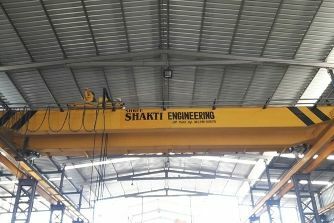 Shree Shakti Engineering cranes are manufacture in such a manners that is easy to operate, cranes administrators just need short preparing on the best way to work EOT cranes. The cranes has solid share that hold the gear well and securely. This reduces the instances of burden falling which may bring about spilling of liquids or damaging of goods causing losses to industries. The may also fall on workers bringing in injuries or even death. As compared to all other in India Shree Shakti Engineering provide Eot Crane Supplier in low and affordable rate. The Cranes uses electrical power which is cheaper compared to heavy engine with overwhelming motor diesel discharge the overwhelming smoke related with substantial apparatus consequently decreasing ecological contamination. This decrease the repair and support cost and augments its working life. As you select correct crane that will fit with the building and the all user should identify and pass on the following key information to the supplier. Note: We as a dam gate manufacturer expert in dam construction and renovate, hydroelectric diversion, storage earth structure of all sizes and our major exporter and supplier machines like Stop Log Gates, Vertical Gate, Gantry Crane, Crane Hoist, Gear Coupling, Tin Bronze Bush and much more. You can avail these products as per your needs and at most affordable price….